Well hello to you my reader chums! Since finishing all my exams I've had a lot of free time on my hands to relax and finally got round to doing my nails, something I've neglected due to revision. As its summer now I've started to get back into more pastel and bright colours. 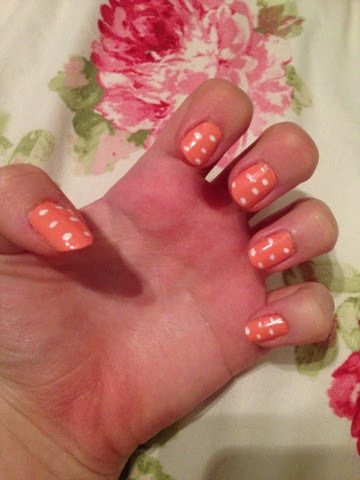 I've also always loved the dotty design, it's just super cute! Here's the pictures of the nails. 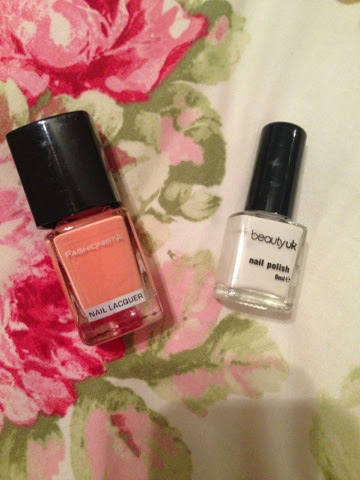 Base: Fashionista nail lacquer in a peachy colour. 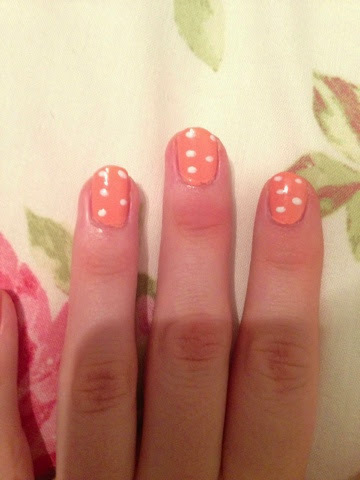 Design/dots: Beautyuk nail polish in a white shade. After applying the lacquer, I use the pointy end of a cuticle tip and dip it in the white nail polish where I easily distribute the dots over the nails. I am not the biggest fan of beauty UK and im not leaning towards it but i might try it. I'll see. Love the dots though!